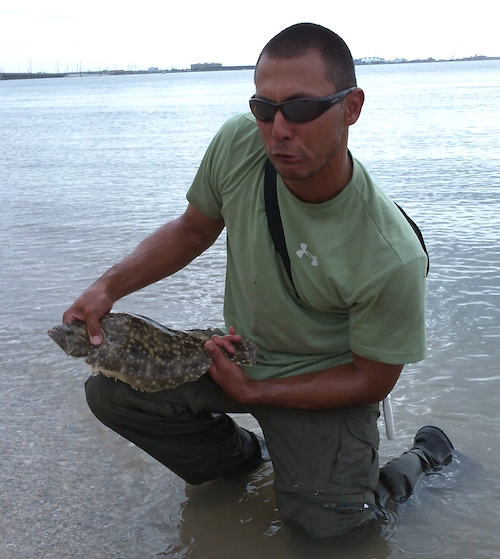 Immanuel Salas fights a flounder on Black Friday – Galveston Texas. Luckily, I had a scouting party ahead of Black Friday this year. A party of one, Immanuel Salas, better known on the kayak discussion boards as “Salsa,” had been on site for a few days. Salsa, armed with some “intelligence” from my experiences, managed to take a bit of the guesswork out of where the flounder were flopping, and the information about Wolf Island lead us there for some combat style fishing last Friday. 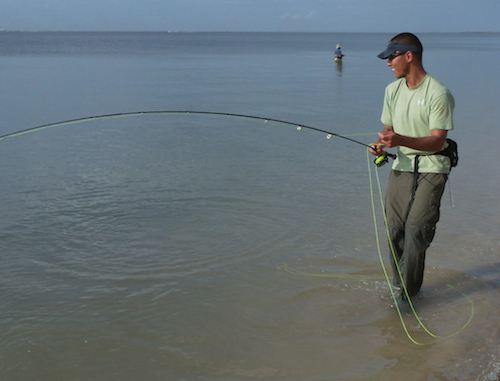 The thought of catching a flat bottom dwelling fish, on a fly rod, is usually met with more than a little skepticism. The answers are not that profound, although I guess I could act like fly fishing for flounder had just been invented. 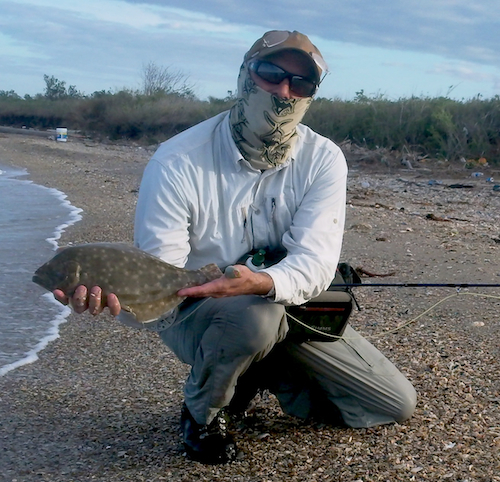 One thing that really helps is the fact that this is the time of the flounder runs on the Texas Gulf Coast. It had become such a phenomenon in recent years, that the Texas Parks and Wildlife Department changed their regulations on harvesting flounder during this time of year. TPWD regulations for flounder take the number of flounder you can legally keep from a normal five down to two. It has only been a couple of years, but there seems to be widespread agreement that this regulation has had a strong positive impact – in a very short time. I realized just how positive when I drove over onto the island, only to find the road leading into the park lined with cars – lined with cars. And the park was filling up with fishers springing for the parking fee (and requisite fishing fee) totaling 12 hard US dollars. I looked back down the shoreline to see fifty conventional fishers lined up combat style, with enough space for respect, and fanning their gulp casts in a fair arc. Along the shore behind them – flotsam and jetsam, lots of it. Some of it looked pretty “fresh” while the telephone poles and wood, and car parts, and boat parts, and pallets all looked so massive that they must have been deposited there during Hurricane Ike. I waded well behind the frontline of fishers, and shored myself as soon as the opportunity arrived. Underneath sections of the water on this stretch are rocks, debris and rusting metal – big and small enough to stub your toe, and definitely require wading boots. Salsa does his best flounder face imitation on Black Friday in Galveston. I was amused to see virtually all the fishers wader-ed up with the air temperature pushing 70-degrees, no wind, and water temperatures at about 60-degrees (best guess). I was perfectly comfortable wet wading with my combat weight Simms boots and gravel guards. The conventional style, for fifty of fifty fishers, is to throw plastic Gulps off the long shallows – either toward deeper water, or back toward the shoreline. 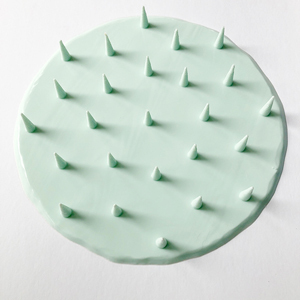 Some throw chartreuse, and some throw hot pink. Many throw a tandem of both. The strategy is pretty simple – get your Gulp down and drag it along at flounder depth. For flounder, it’s blatantly irresistible. 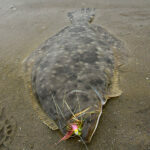 The presentation for fly fishers trying to hook these flatfish has proven to be very similar. The last time I fished for flounder near the Galveston Jetties tidewaters, was somewhat different – there was no wave or tidal current action. It was a matter of getting a pink over chartreuse heavy Clouser down on their level, and doing long (3′) slow strips. If you can feel the fly dragging the bottom, you’re there. You will also need to be certain you are using a fluorocarbon leader that’s a full 9-feet or longer. I made my way past all the friendly combatants, as usual, looking to go 20-percent further to get away from 80-percent of the combatants. The looks that came my way said it all. A fly rod? It didn’t take too long to get the feel of a flounder on my fly. They are a fun fight, and you have a clear choice of making it a long or short affair. Flat fish swim … well they swim flatly. 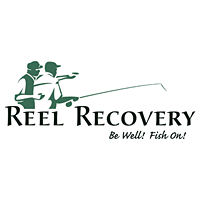 Rod tip up will insure an advantage to the fish, while side pressure will end the fight almost immediately. Gear that conventional guys load up with includes; floating fish keepers, nets, stringers, wading belts, waders and floating coolers. Most conventional fishers look to travel pretty heavy. It’s entirely possible to cast from shore and reach the flounder, but chances are you will do better wading as deep as above the waist in order to cover more water. This is one time you can go heavy or light. One thing you will have to bring, not an option – BUG SPRAY. The mosquitoes there are ferocious and relentless. I took bites to the hands and face (through my Buff), that left welts. If they find an opening, they will keep at it until the bitter end. My scout showed up later in the day, and we tried a less crowded area at the other end of the island. Flounder were there as well, but we knew the changing tide would bring more flounder in close, so we made our way back toward the park and threaded our way in and through the combatants. We managed a few more flounder by day’s end. As we were walking away along the road, a fisher driving alongside asked how we did. “Pretty good,” was our answer. “It’s not even the best time yet. The fishing is much better in December,” he said. I filed that away.